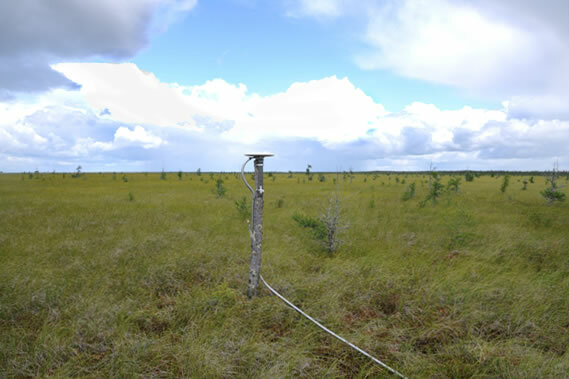 Three new continuously operating GPS stations were added to an existing network of 11 GPS stations in the Red Lake Peatlands of northern Minnesota. The three new sites are installed in a triangular formation, each approximately 20 meters apart. Nested within the GPS triangle are 31 radially arranged instrumented piezometers. 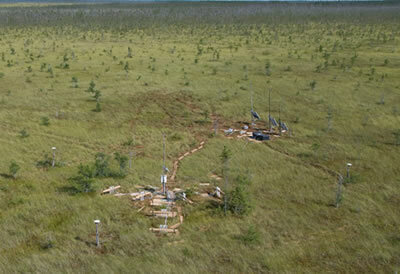 At this location, the peat is over 4 meters thick and contains large pockets of gas with high methane concentrations. The GPS receivers monitor surficial changes that are the result of degassing events which can deform the peat surface by up to 10 cm in a few hours. The co-located piezometers monitor pore pressures which can be used in conjunction with the GPS data to determine changes in gas volume and water storage. Figure 1 - The GPS array viewed from a helicopter. 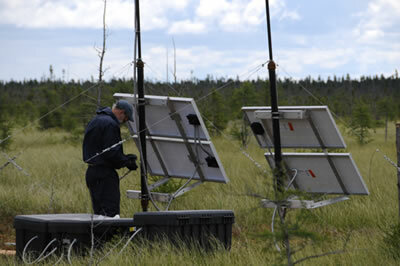 The three antennas are mounted on tree trunks and surround an array of peizometers. Figure 2 - PI Paul Glaser installs guy wires to help support the solar panels. The GPS receivers and battery banks are located in the black cases in the foreground. Figure 3 - The GPS antennas are mounted on Spruce trees that have been cut to half their original heights and had their boughs removed.